How is the FE-CBT structured? How is the new FE-CBT different from the old EIT/FE test? When is the FE-CBT given? When should I register for the FE-CBT? How much does it cost to take the FE-CBT? What is a good score on the FE-CBT? When should I start preparing for the FE-CBT? How much math do I need before I can start preparing for the FE-CBT? What calculator may I use for the FE-CBT exam? What PM depths are covered in the course? Is the Testmasters FE-CBT prep course for me? How is the Testmasters FE-CBT course different from other courses? How much do I have to prepare before taking the course? How does the Guarantee of Passing work? Who teaches the Testmasters FE-CBT courses? How can I find out more information about the FE-CBT exam? The FE-CBT stands for Fundamentals of Engineering – Computer Based Test. It is typically the first step in the process leading to the P.E. License. It is designed for recent graduates and students who are close to finishing an undergraduate engineering degree. The FE contains 110 multiple-choice questions. The exam appointment time is 6 hours long, which includes a nondisclosure agreement, tutorial (8 minutes), the exam (5 hours and 20 minutes), a scheduled break (25 minutes), and a brief survey. The FE is offered in 7 disciplines: FE Chemical, FE Civil, FE Electrical and Computer, FE Environmental, FE Industrial, FE Mechanical, and FE Other Disciplines. The EIT/FE, which stands for Engineering-In-Training/Fundamentals of Engineering, was the former exam that was replaced by the FE-CBT. The FE-CBT was created in order to shift from the written exam to a computer-based exam. The FE exam is regulated by the National Council of Examiners for Engineering and Surveying (NCEES) for all licensing boards. It is administered year-round in testing windows at NCEES-approved Pearson VUE test centers. Contact your state’s licensing board for registration requirements and deadlines. To register for an FE exam, log in to your MyNCEES account, select the REGISTER button, and follow the onscreen instructions. Learn more about the exam and the exam environment by reading the rules and policies in your NCEES Examinee Guide. The FE is scored on a pass/fail basis. Below are the pass rates for the April 2006 exam. Most students take the FE exam the last semester of their final year or shortly after graduation, while the technical information they studied is still fresh and they are still in ‘test mode’. How much math do I need to know before I can start preparing for the FE-CBT? Casio – All FX 115 models. Any Casio calculator must contain FX-115 in its model name. Texas Instruments – TI 30X or TI 36X. Any Texas Instruments calculator must contain either TI-30X or TI-36X in its model name. Each year, NCEES will review the approved calculator list and announce updates by November. The Testmasters FE-CBT course prepares students for the General exam in the morning and afternoon session. The Testmasters course is designed for students who have been out of school for a while. We realize that you may not have practiced many of the topics covered on the exam since college. Testmasters’ focus is to give you a concise, intensive, and structured review of the important topics needed to pass the exam. We use our workshop sessions to ensure that you get the practice applying these topics in a problem-solving environment. The Testmasters FE-CBT Course Coordinator has been teaching the FE-CBT courses for over 25 years, and is very well versed with the format of the exam and what it takes to pass it. The Testmasters FE-CBT Course is focused only on the exam and helping students pass. The course is comprehensive with 72 hours of instruction for the PE courses, and 80 hours of instruction for the FE-CBT courses. In the course, concepts are reviewed and many problems are worked out in class. This helps students become familiar with solving problems that are similar to what is on the exam. The Testmasters course is not a college course, which is designed for their students and covers theory. The Testmasters course is focused on the exam and helping you pass. As a result of the quality of the Testmasters FE-CBT and PE courses, we are able to offer the Guarantee of Passing. If you take and attend the Testmasters review course and workshops and do not pass the first time, you can retake the entire Testmasters FE-CBT Test Prep Course again at no charge. Most of our students come to the course with little or no preparation. However, if you have been out of school for many years, we would recommend that to get the most out of the courses, some preparation would be helpful. Knowing the fundamentals while in the Testmasters course will help you grasp the information more quickly and focus on learning the material taught in the course. You can pick up any engineering book to begin reviewing the topics covered on the exam before the first class. If you attend every class of the Testmasters review course and workshops and don’t pass, you can repeat the next Testmasters FE-CBT review course and workshops absolutely free. To get the guarantee for the FE-CBT, you must take the next actual examination given after the completion of the course. For the Principles and Practice examinations, the actual examination must be taken within nine months after completion of the course. The free repeat is limited to only one time, and it must be used in the next course offered after the results of the actual examination have come in. Subsequent repeats within 18 months will be at 50% of the regular fee. No course is guaranteed to be offered at the previous location or every time the actual examination is given. There are no workshops for Chemical and Environmental Engineering; therefore, no Guarantee of Passing applies. All classes within a Testmasters course need to be attended for the Guarantee of Passing. This is also for your benefit, as attending all classes will increase your chances of passing. However, we understand that sometimes unavoidable circumstances come up and you are unable to attend. For that reason, we are flexible in allowing you to miss up to one topic session per Testmasters FE-CBT course, and the guarantee will still apply. Testmasters’ instructors come from the industry and academia, and are highly qualified in their specialized fields. 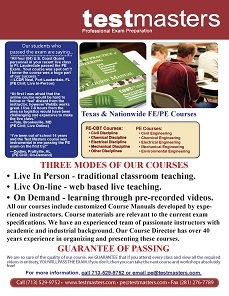 They have taught FE-CBT/PE courses for many years at various companies including Central and Southwest Services, Bechtel, Kellogg, Fluor, Sirrine, Lummus, Ericsson, Texas Instruments, Foster Wheeler Energy Corp., Texas Department of Transportation, Virginia Department of Transportation, Utility Engineering, and the City of Austin Electric Utility Department. Because we have many students attending the Testmasters FE-CBT Test Prep Course from out-of-town, we usually conduct our classes in classrooms at hotels. For students needing to stay overnight, our group has discounted sleeping room rates with the hotel. This information will be provided after registration. Please visit www.ncees.org for more information. There are a few options to register for a Testmasters FE-CBT course. You can register online at our website or you can print out the registration form, fill it out and fax or mail it to our office. Our fax number is 713-529-4394. You can also call our office at 713-529-9752 and register over the phone. Full-time undergraduate students will receive a 50% discount off the regular fee when taking the Testmasters FE-CBT review course with workshops. We will need a copy of your fee slip from the registrar’s office showing that you are enrolled in at least 12 credit hours in the current semester. No additional discounts will be given. The student discount is not offered for the Testmasters PE course. Three days before the start of the course, the fee will be fully refunded. Afterward, up to one week, refund will be on a pro-rata basis less $150 administrative fee upon a written request for a refund. No refund will be given after one week of the start of the course. No refund will be given for the classes missed or not attended prior to our receipt of the written request. No refund will be given for not repeating the course. It is not transferable to any other course or person.